Sometimes a project can take over a workshop absorbing you into its world of magic, colour and design. 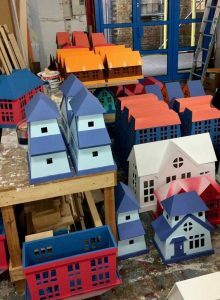 This is what happened when we were asked by award winning set designer Rob Howell, to make 150 model houses for the backdrop of the stage adaptation of Groundhog Day. The musical was based on the popular 1993 film starring Bill Murray as a TV weatherman who visits the town of Punxsutawney to cover the annual Groundhog Day event. The term ‘Groundhog Day’ originated in1840 and is meant to predict the arrival of spring and is celebrated every February in the US and Canada. It is based on the superstition that if a groundhog sees a shadow as it emerges from its burrow it will retreat and winter will persist for another six weeks. To officially mark Groundhog Day, every year crowds of up to 40,000 transcend on the Pennsylvanian town of Punxsutawney. We worked on this project for around six weeks during which time our workshop developed into Punxsutawney and like Bill Murray’s character in the film, (who is caught in a time loop repeating the same day over and over), we certainly felt like we were caught in our own repetitive loop, where each day we made and were surrounded by colourful miniature buildings. 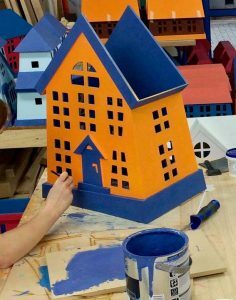 The 150 model houses of various shapes and sizes were produced from CNC machined PVC Foam sheet and then each one lovingly hand painted with emulsion. We delivered the finished models to the theatre in batches, making way for the next production run, repeating the process all over again. This was a fun project to work on and we were incredibly proud to have played a part in this amazing stage production. The critically acclaimed musical showed at the Old Vic Theatre in London before then having a spell on Broadway and winning several awards. 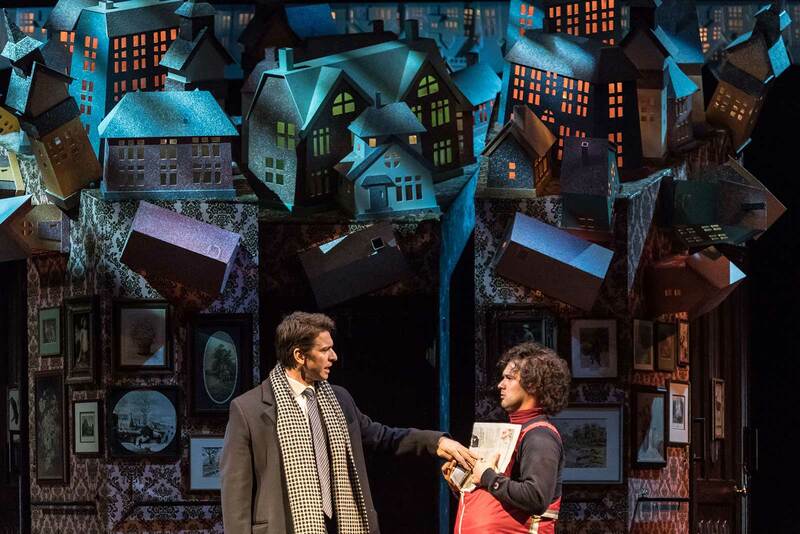 We were delighted to be invited to the opening show and to see the finished set design in all its glory. Seeing it come to life certainly made up for all those days being caught in our very own London Groundhog Day scenario.